My oldest, Magpie, started skiing last winter, and loves it. This year she plans to ski a lot -- that is if it ever becomes winter weather here on the East Coast. One piece of equipment I wanted to make sure she had was a good pair of ski goggles. We were able to review a pair of ski goggles from AC Lens, which Magpie says are really comfortable, and we both agree look great. 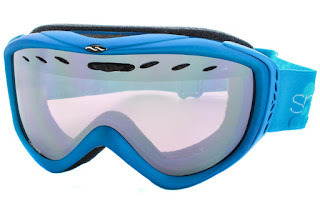 These goggles are designed for smaller faces, so they are a great choice for tweens and teens. The Smith Optics Cadence Ski Goggles retail for $79.99 at AC Lens, and come with free shipping. To see the goggles in action, check out this great video Mapgie made. In addition to a wide variety of ski goggles, AC Lens also has eyeglasses, sunglasses, swimming goggles and a lot more. Check them out at ACLens.com.